MILAN, Italy (VIP NEWS) — Motorhead have had to cancel two European gigs after their frontman Lemmy suffered a haematoma. The band cancelled last night's show in Milan (June 25) and also had to cancel their gig on June 22 at a festival in Austria, reports Ultimate Classic Rock. The size, scale or location of Lemmy's haematoma – where blood collects outside of a blood vessel – is not known, but the news of the medical problem follows reports that the frontman has also recently been fitted with a defibrillator because of heart problems. 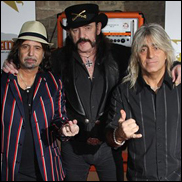 Last year, Lemmy spoke out about plans for Motorhead's forthcoming 40th anniversary, which will take place in 2015. The metal legend said: "We'll think of something; we always do – probably involving naked women or something."